Peterborough Panthers have been hit by the shock exit of a rider - less than a week before the start of the new season. The city club have confirmed this lunchtime (March 27) that former British champion Craig Cook has been ‘reluctantly released’ from their line-up for the SGB Premiership campaign. The Peterborough Telegraph understands that Cook had a verbal agreement to race for Panthers in 2019 with the club’s previous management, but has since refused to sign a written contract despite the best efforts of the current promotion. Co-promoter Carl Johnson said: “I have been in dialogue, mainly by text message, with Craig as it has been extremely difficult to resolve issues by the old fashioned way of talking to him. “We accept and understand that he will not sign a contract with Peterborough Speedway and we will now move on. “As a club we have tried to keep this as amicable as possible and we would like to extend our very best wishes to Craig for the forthcoming season. The sudden departure of Cook, who has had two previous spells with the city club, means Panthers do not have a full team of riders for their Press & Practice event which is taking place at the East of England Arena now. 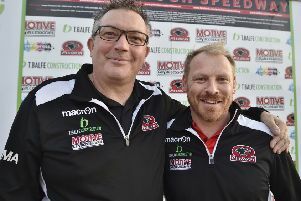 But Johnson is adamant a new capture will be in place ahead of their opening meeting on Monday (April 1) when they host Cook’s former club, Belle Vue, in the Premiership Supporters’ Cup.